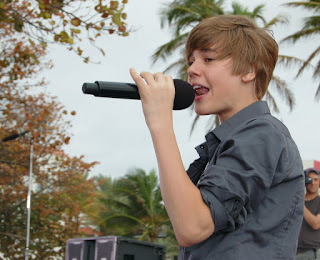 Yes, I was up early on on the beach set of The Early Show at 7:30 am to see the young singer Justin Lieber perform for a crowd of screaming young girls. I wasn't a fan before but now I am. He's a very talented and charismatic lad. And to think it all started because his mom posted a video of him performing on YouTube. Maybe I should post a video of myself writing on YouTube, nah, that wouldn't work. Maybe a dramatic reading from my book SOUTH BEACH STAR might catch someone's eye. Who knows. I'm searching for new and unusual ways to get noticed and make money. Anyone have any ideas?